Over the years, when contemplating such things as the Holocaust, I have often wondered how the German people could stand by while such atrocities were perpetrated. Estimates are that more than 6 million Jews were killed over a 12 year period. Many of these met their fate at concentration camps such as Dachau, or in what may be more accurately called death camps such as Auschwitz or Chelmno. I have often thought upon the stories of how the Allied forces, when they liberated the camps, forced the local citizens to go out to the camps and view the results of the great evil which they had allowed to take place. Many of the locals expressed some level of horror, claiming they really didn't know what was taking place under the Nazis. Still, I could never quite accept that, and would be left feeling that the people should have risen up against their government and come to the aid of their fellow human beings. I could not help but think that if I had been in that position I would not have stood for it. I'd have had to do something. Conscience would have demanded it regardless of consequences. Just what kind of depraved citizenry could allow such a thing to happen? Fast forward 70 years. The Jewish Holocaust only a painful memory. Yes, there is a whole religion which simultaneously denies the first Jewish Holocaust while it preaches the need for a second, but we have not yet seen its implementation. However, we are already in the midst of another holocaust involving even greater numbers and just as much evil. If you can watch the following video and join your fellow countrymen in calmly sitting by and ignoring it, ...well, then it would appear that your conscience is already seared. In our hearts and minds we cannot help but pass judgment on those citizens of Nazi Germany who turned their backs and ignored the evil which was happening in their midst. But we should be careful to keep a mirror handy. Do you believe the German people individually bear some responsibility for their lack of action? Then we bear some responsibility for our lack of action in our modern abortion holocaust. Do you believe that the downfall of the Nazi government was a just reward for carrying out the Holocaust? Then where does that leave our nation? Not exactly what one might call "timely" but I thought a short report on the 2015 Meltdown Drags to be in order. That it lived up to its name is an understatement. Hot, humid, and more hot. As per my plan, I spent a little time before the event putting together a 4 speed transmission for the Knuckledragger, and got it installed with about a day to spare. The largest obstacle turned out to be the most expensive piece involved in building the transmission, that being a new reproduction ratchet lid. Ratchet it did not. Thankfully I caught the problem while "dry shifting" it before even putting it on the trany. it would have been quite discouraging to get to the track only to be plagued by shifting problems once again. As it was, all it cost me was a bunch of time to figure out and modify the part so that it would function. Rather than traveling in style as we did for last year's event, this time around we went for practicality. That means that in place transporting the Knuckledragger on an open trailer behind our '46 Studebaker, we put the bike in our small enclosed trailer and towed it with our '90 GMC pickup. I guess one person's modern is another's vintage. Even our enclosed trailer took the opportunity to remind us just how old it is by shedding the tread from one its tires near Madison Wisconsin. That's right, even our "modern" enclosed trailer is so old that the tires I remember buying for it nearly 20 years ago (because we wore out the first pair traveling all over the country to drag races) disintegrated due to age. The good LORD was looking out for us though; and the tire never even lost air, allowing us to pull off the freeway to install the spare which I had remembered to air up at the last minute the night before. A short detour to a Farm and Fleet store got us back on the road with a new pair of tires, delaying us just enough to insure we would not have time to make any passes on Friday. Hard to believe this still held air! The start up revealed that the bike was running good. The idle was higher than I remembered, but it was also seemed to be much more consistent, so I decided against messing with it. The clutch was releasing nicely, and combined with the good idle characteristics, allowed me to take my right hand off the throttle to reach across the tank and put the transmission into gear. Yes, that's right: a hand shift and a hand clutch, both on the left side. That drew more than a couple puzzled glances over the weekend. It starts, it runs, and it will go into gear. Better make a pass! As we brought the bike up to the staging lanes late that morning, I had two concerns. One was the start and the other was the finish. The 5 inch slick on the back of the Knuckledragger with its modern compound, combined with extremely sticky track preparation courtesy of the Byron Dragway crew, is a recipe for wheelies. Add to that the fact that the new transmission has a first and second gear, unlike the third and fourth in the old two speed it replaced, and I was a little concerned with how the bike would launch. The second concern had to do with the finish. Last year's lone trip down the 1/4 mile plagued by shifting problems was not much of a test of the Knuckledragger's 1930s designed brakes. I really prefer to be able to stop while still on the drag strip! That first concern was solved rather easily by a combination of staging to the outside of the portion of the track that was heavily prepped. Since the Byron dragstrip is unusually wide (in the 60s they would race the cars 4 abreast) there was still plenty of room between where I staged and the edge of the track. As an added precaution I "drove" the bike off the starting line rather than launching it. Once off the starting line, the bike went straight as I poured the coal to it. This and the previous photo were passed on to me by way of Kevin Baas. Thank you to whoever took the pics and sent them to him. The shift from first to second was exactly as it was supposed to be, fast and clean ...as was the shift to third and again to fourth! Finally. This was the first time in four outings that this bike had shifted properly. But now my second area of concern was rapidly approaching. In fact, it seemed to be approaching too rapidly! About 200 feet from the finish line that concern turned into fear that I would not be able to get the bike stopped within the confines of the shut down area so I shut the throttle and laid on the brakes. 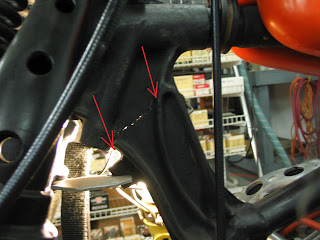 Of course the rear drum brake coupled with the just barely "better than nothing" springer front brake does not give anything like the sensation of modern brakes, but I did get stopped with some room to spare. 12.228 seconds at 97.03 MPH. The time slip shows the Knuckledragger was clipping along at over 91 MPH at half track so I have to wonder how fast it was traveling before I hit the brakes. Something about high temperatures and humidity is not conducive to putting on a helmet and a full set of leathers. It was apparent that the heat was also limiting the number of cars getting into the staging lanes also. About mid afternoon I decided that if I did not get up there for another pass, I would be too worn out from the heat to do it at all. This time I did not concern myself as much about the starting line, staging a little more into the sticky part of the track (though still far from where I would have if looking for maximum hook up). That was probably a mistake. I left just slightly harder than the previous pass, which sent the front wheel reaching for the sky. Well, at least from my viewpoint it was high, but such things can be deceptive when you are lying down on a bike. Unfortunately my staff photographer had just finished helping with the whole starting the bike drill and had no time to get in position to record it for posterity, so we may never know just how far the front wheel came up. In any case, rather than shutting the throttle and slamming the front end down, I eased off enough that it came down with a reasonable amount of gentleness, and then immediately came back up as I got back into the throttle. The second wheelie was a much more half hearted effort on the Knuckledragger's part though, not requiring me to let off. Once again, this description is from my perspective. If ever any video evidence surfaces, it may reveal that I handled the wheelies with far less professionalism than what it felt like from behind the bars. Despite an abysmal 60 foot time owing to the acrobatics, the shift into second was good, but then at the top of second gear the motor started to break up. What? My first thought was valve float, but that had never happened before. Hitting third gear cleared up the motor and it pulled hard until near time to shift into high. This time I glanced down as I shifted only to see that as I moved my arm to shift it pulled the sleeve of my leathers out of the front carb into which it had been sucked! Happy to know that I was not dealing with engine damage but merely rider error, I kept the throttle wide open to the finish line. The E.T. suffered greatly from the multiple fiascos on the run (14.12) and the MPH did not fare much better (101.4). Again the half track MPH is quite revealing. Apparently having a sleeve in one carb is enough to knock 12 MPH off your speed at the 1/8 mile mark compared to the previous pass. But you know what? That turned out to be a good thing. I had no plans to make another pass due to the temperature. That would have been just asking for heat stroke. In fact I remember saying to someone after that second run that it was my last because there was no sense pushing my luck. Remember near the beginning of this post when I mentioned the LORD looking out for us with the trailer tire? What we found on the Knuckledragger after we returned home made the trailer tire pale in comparison. The neck on its 1930s era frame is cracked, and not just cracked, but CRACKED! In fact you can see daylight through the crack it is so cracked. A little back lighting reveals a major crack. Red arrows point to start and end points. You often hear, "somebody up there is looking out for me." Yes, well that is true, but I know who that somebody is and I'm willing to say it. The LORD God almighty, YHWH is his name. I come to you with a troubling post today. Some may dismiss it as being just too "sentimental" or dismiss me as someone who just needs to lighten up and not take life so seriously. Perhaps many of those who have not spent countless hours on the same old Harley over long periods of time (time measured in decades, not years) will not feel the same. But if you have ever owned, ridden, and lived on/with the same bike for enough time, then you too will likely have formed a bond with it. That bond is often forged while tuning and repairing, repainting and rebuilding the same bike over and over through those many years of ownership; or should we say years of partnership? How often have you heard a fellow enthusiast refer to his motorcycle as his "baby?" Is it any wonder that often the feeling that the machine is more than just the sum of its many mechanical parts is expressed by the bestowal of a name. But even those not predisposed to naming their bikes often wind up feeling that their "old friend" has taken on some type of life of its own, or at least some sort of mystical mechanical soul. I know you guys are out there, because some of you have brought your bike's engine parts to me with the confession that you are VERY careful about to whom they will entrust the internal organs of their pride and joy. Yes, it is plain that many old time bikers would probably, in a moment of sentimentality, wax poetic and confess that there just might be something to the whole idea of old Harleys having a soul. And that is what makes the subject of this post troubling. I would like to address is what seems to be an increasingly common practice of "parting out" complete and running condition vintage Harleys. Though it is certain that there have always been back alley operations involved in the dissection of old Harleys, the practice has become more lucrative recently with the popularity of the eBay worldwide marketplace. Given the ever increasing price of vintage Harley parts, I suppose it was bound to happen. It seems that some individuals have found that some old Harleys are worth more in pieces than as a "project" bike, or "basket case" as we used to call them. This practice of parting out viable Harleys recently came to my attention via the aforementioned eBay. One need not search too deeply under Antique, Vintage, Historic in the Motorcycle Parts category to find one. 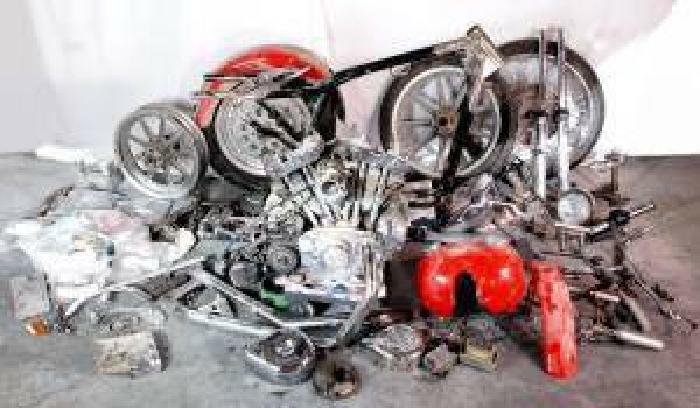 Often the purveyors will be so blatant as to include an admission in the advertisement to the effect that they are parting out the motorcycle so be sure to check their other auctions for the rest of the parts offered. And we can mourn one more vintage Harley which was once someone's 'baby" that will never again feel the wind of freedom against its headlight. The callousness these butchers display as they calmly admit to their profiteering while offering up the parts to the highest bidder is beyond the pale. Okay, if you took the time to view the video, you have realized that it is not about parting out old Harleys, but about something infinitely more wicked; parting out new babies. If you could read my post leading up to the video and have the slightest feeling of agreement, then how much more should you be totally outraged by the practice of Planned Parenthood in not only murdering babies, but then going the extra mile on the road to hell in profiteering from their now lifeless bodies. It is true enough that we should be far more outraged by the killing of these precious souls than we are by the ghoulish selling of their body parts, but perhaps we have become too complacent with the evil that has been among us since 1973 when the Supreme Court legalized the murder of these babies. Maybe the new revelations of depravity will temporarily be shocking enough to force this nation to turn back from its wicked course. If you are not a Christian, and you shrug your shoulders at this sale of dead baby parts, then you are heaping coals of fire on your already sin laden head. If you are a Christian but you are too busy to spend a few moments fighting this spiritual wickedness, just how do you plan to explain that before the judgment seat of Christ? All I ask is that every one of you who are men of conscience take a few minutes to do something, whether it be contacting your elected representative, passing this or similar articles along via social media, sending links to your friends and acquaintances, or praying. We all need to do something to not only denounce, but to stop this barbaric practice of child sacrifice.